Gutter covers help eliminate the collection of dirt, animals, leaves and debris that can clog your drainage system. 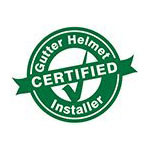 At Gutter Helmet by Harry Helmet, we install the original gutter protection product in the industry to remove the fear of damage to your home caused by water leaks and overflows. The unique design of our seamless gutters prevents clogs by allowing water to flow down freely. It also eliminates the dangers associated with climbing a ladder and trying to clean the gutters on your own. When you are looking for the original Gutter Helmet in the greater Cleveland and northeast Ohio areas, look no further than Gutter Helmet by Harry Helmet. Our team of specialists can install the gutter systems that will improve your home’s exterior and enhance its value. Here at Gutter Helmet by Harry Helmet, we provide the ideal choice for keeping debris, dirt and leaves out of your gutters. The only thing that gets in is water. In fact, it protects your home’s exterior by filtering away water from the foundation, providing you with the worry-free knowledge that your home is free from water damage. For superior gutter products in the greater Cleveland and northeast Ohio areas, contact Gutter Helmet by Harry Helmet today at (800) 824-3772. We are pleased to discuss details about our services and schedule a free, no-obligation quote. You can also use our convenient online request form.